What if you could complete an online class on your own time and at your own pace? What if the class could react to you – and personalize lessons for you? Now it can. Recently, FIU Online partnered with Realizeit, a company that provides adaptive learning software. Considered by many the next step of online learning, adaptive learning is a method that uses technology to create an environment where students can learn at their own pace and have course content customized for them. During Fall of 2016, two courses in the Health Policy and Management master’s degree were offered using the Realizeit program; this semester, one class for the same degree is being offered. The department plans to continue introducing more and more classes through Realizeit, making the Health Policy and Management online master’s degree a fully adaptive learning experience by the end of 2018. 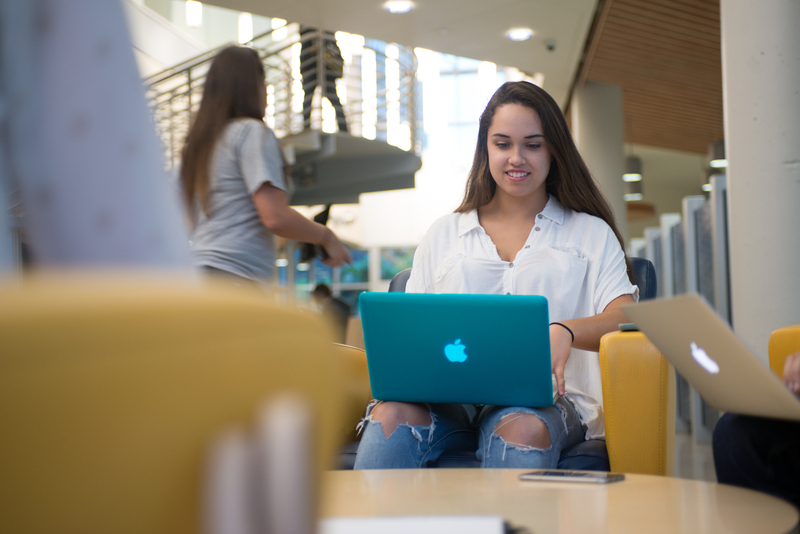 And FIU Online is working with the Psychology department to introduce adaptive learning modules in some undergraduate psychology classes during the summer. For Health Policy and Management Chair Ben Amick III, adaptive learning offers a way to help students build on their work experience or any prior knowledge they have before entering the class. Redesigning courses as Realizeit courses provides a solution. Adaptive learning provides what Educational Technology Manager for FIU Online Gus Roque calls an academic GPS for students: a learning path – a flow chart that maps the course out for students and organizes building blocks of knowledge as specified by the professor. The learning path updates itself automatically as Realizeit keeps track of each user’s clicks and activity – and personalizes content accordingly. Just one example of this customization: For visual learners that click on videos more often, the program will offer more video content for that student to view instead of text-heavy presentations or other forms of content. In regards to pacing, users can progress through modules as fast as they like. And students can also go back and re-do certain modules until they feel comfortable with the material. Roque explains that since Realizeit tracks each user’s activity, professors can map out the trajectory of the entire class to see which topics students are quickly mastering and which ones they are struggling to understand. With this kind of data, Roque says, professors can start identifying which topics are crucial to student success, revise or add to their assignments accordingly and then try to help students who are struggling with those crucial topics. Cassandra Jean, a student earning her master’s in health policy and management, took “Introduction to Public Health Policy Management” using Realizeit last semester. Since she juggles a tight schedule between working full-time in the health care industry and attending school full-time, she says one of her favorite parts about using Realizeit was going through the material at her own pace. Based on the questions Jean answered accurately or inaccurately, Realizeit gave her feedback and continued to provide the same type of questions she had answered incorrectly, without asking the same exact question again. Besides students passing their classes successfully and graduating on time, Amick says adaptive learning is about making sure students enjoy the class and learn the skills they need to get a job. That’s what student-centered education is all about.